Mariella says “’There was once’ or Once upon a time or ‘Here is…’ or ‘Acka Backa…’ There are many ways to start to tell a story or to capture those who are before you. These are tricks of the trade that I, as many storytellers, know well. I also love the silence of the stories that make us tell and listen in a deeper way. I love telling stories to audiences young and old from babies and tots to children and teens, adults and seniors. I have stories that appeal to specific age groups but I also know and tell stories that I am able to adapt for listeners of any age. For preschoolers I tell tiny stories using rhythm, repetition, pattern, sounds and rhymes. Mariella Bertelli is an international, Toronto-based storyteller who tells fluently in English and/or Italian. 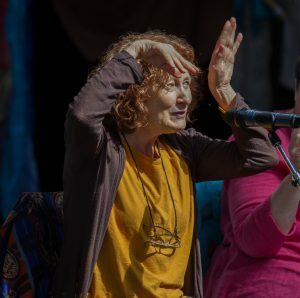 She is a longtime and experienced storyteller, with a wide repertoire of world folk and fairy tales, especially from her Italian heritage, while she has also developed stories from her Canadian newcomer’s experience from when she first arrived as a teenager. Mariella’s style is varied, from longer narratives to tiny tales, she adapts her craft to suit young and older audiences. She sometimes uses other arts, like Bankelsang, Kamishibai and tall or miniature puppets. Her rhymes and rhythms enchant little ones while her family sagas of migration and endurance captivate older children and teens. Mariella began storytelling while doing Children’s theatre, touring schools, libraries and playgrounds in Toronto. After she completed her Master in Library Science, she became a Children’s Librarian for 22 years, integrating storytelling in her library programs with children of all ages, including babies and teens. As a storyteller and through her work as a member of IBBY (International Board on Books for Young People), Mariella has been an advocate for children and young people’s rights to stories, literacy and information. Her passion for stories and her interest in human rights issues have brought her to the island of Lampedusa four times, to create a children’s library there for the local and the refugee children. To bring attention to Lampedusa and the refugee crisis, she brought to Canada the Silent Books Exhibit that toured in six Canadian cities in 2015-16. Mariella traveled along telling stories, while also advocating for literacy and outreach to newcomers. With this project she was invited to speak at the 1st IBBY Europe Congress in Bologna, Italy, in April 201: Bridging Worlds: Reaching Out to Young Refugees with Books and Stories. She has also developed a training program on how to use stories and books for people working with newcomers and refugees, The Voice of Books: Practical Instructions on How to Use Books and Stories, presented in Rome in October. Mariella has been telling at National and International festivals, events and conferences in Canada, the U.S., South Africa, England, Belgium, Italy; she has taught storytelling courses and has presented a variety of workshops to adults, children and families; she has been a speaker on storytelling and is active in the storytelling world community. Working to further develop storytelling as a performing art, Mariella has in the last four years directed storytelling group shows, while also mentoring and coaching younger tellers. She continues to have a fascination and curiosity about the power of stories and still loves to explore the medium on her own and with others.